This week: Cree doubles the lumen density of a chip-on-board array, a ballplayer pitches LEDs, and Philips drops the price on its 60W replacement at Home Depot. The company, parent of this site's sponsor Lumileds, announced that its 11W LED A19 bulb will sell at Home Depot for $14.97, down $3 from its previous price point. Philips pointed out that many of the 6,000 utilities across the US offer rebate programs on some Energy Star-qualified LED lighting products. The Philips bulb is not listed as being so qualified by Home Depot, according to Illumination in Focus, but Philips said that the qualification is in hand and that the retailer's information will catch up soon. We covered NliteN's 2D-Lite LED Disk when its Indiegogo campaign was announced earlier this month. As we mentioned at the time, the startup rushed to announce in order to be able to participate in the Philips Innovation Fellows competition. 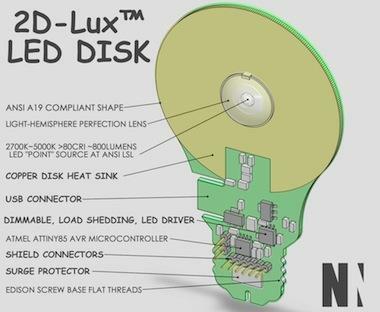 This week brought news of one major development that got left out of the earlier announcement in the rush: NliteN has now added a configurable, hackable smart bulb -- the 2D-Lux Smart LED Disk (SLEDD) -- to its project description on Indiegogo. This bulb, with a target price of $25, will feature an ATMEL microcontroller, USB port, and a connector for plug-in "shields." These are small and low-cost plug-in hardware modules that extend the functionality of the light bulb with additions like a motion sensor or a microphone. The shields, software to run on the ATMEL, and apps for smartphones, will be available in an online store. Ambitions plans. But the first hurdle NliteN needs to clear is Indiegogo funding. It is not looking promising at the moment: the project is 1 percent of the way to its goal with 25 percent of the campaign's time spent. The company announced the 9mm CXA1520 array that is capable of producing 2,000-4,000 lumens from its 9mm light-emitting surface. That is a sufficient density of light -- 40,000 cd of center beam candle power -- that the device can replace a 39W ceramic metal halide (CMH) source, using only half the power, in applications for which halogens can't produce the required punch. The COB is available in sample quantities in 2,700K to 5,000K CCT, with CRI of 70, 80, or 95. LEDs Magazine reported that a spokesman said the CXA1520 uses a new substrate material. We can assume it's still silicon carbide, but perhaps a new formulation. That headline is more literal than it might first appear. The retiring Yankees pitcher, who hails from Panama, approached the Florida-based LED lighting company. He challenged them to create a unique product that honors Rivera's career, and that can be sold to raise money for the ballplayer's charity in his home country. A LED baseball is the result. Evolucia cautions that you can play catch with it, but would be ill advised to lay a bat on it.